A frequently asked question for jaw couplings is: “How much life can I expect out of the spider?”. The answer to this question is, unfortunately, nearly impossible to determine. Spider life is affected by a variety of factors (i.e. high/low temperatures, chemical exposure, operation cycle of machinery, etc). Lovejoy does provide advice on spider inspection and replacement. When the spider’s leg volume or thickness is at 75% of the original volume or thickness the spider should be replaced. Inspection of this can be done visually and will result in disassembly of the coupling only if the spider needs to be replaced. 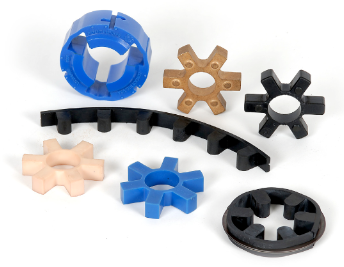 Correct installation of a jaw coupling can greatly increase the life and performance of the elastomeric spider. The installation process starts with the correct coupling selection. The selection process starts with collecting the proper information about the application. These factors would include: horsepower, RPM, shaft sizes, the type of driver/driven equipment, type of chemical exposure (if any), and temperature exposure. After selection, proper installation and alignment are also key factors. To learn more about coupling selection criteria, please check out "Top Ten Factors for Selecting A Coupling". For help with calculating required system torque, check out "Coupling Sizing Torque - How to Quickly Calculate (inclusive of Service Factor)". Jaw couplings are not only one of the most popular and economical flexible coupling solutions in the world, but they also offer a solution that does not need lubrication. This can be a tremendous time saver, but low maintenance couplings does not mean no-maintenance! By following the helpful tips above (and two robust articles recommended below), coupling users can ensure that their jaw couplings are in proper condition and avoid unexpected downtime. Recommended Follow-On Reading: For a robust report on jaw coupling failure analysis, please read: Coupling Failure Analysis - Jaw Couplings (includes hub & spider photos). For a broad overview of jaw couplings in general, please read: Jaw Coupling Overview - Features & Benefits, Design Basics, and Element Options.